Jacob Fattakhov is a rising junior at The Middlesex County Academy for Science, Mathematics and Engineering Technologies. Always drawn to math and science, Jacob leapt at the opportunity to participate in a specialized program and now takes college-level electrical engineering every day. He chooses to channel this knowledge into the Computer Science Club and various personal projects. In his free time Jacob enjoys swimming, roller-blading, and video games. In the future, Jacob plans on pursuing a career in the field of computer science. 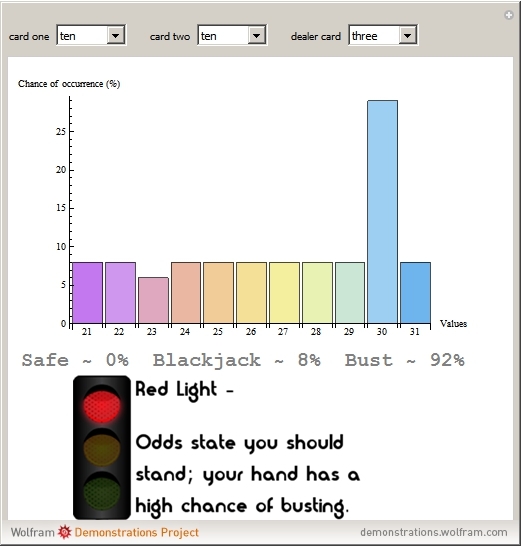 The dynamic blackjack card will take the user's first hand as well as the dealer's card, using the information to produce an infograph of all possible outcomes. The user will see these outcomes and their probabilities, finally receiving a suggestion on their next move. The suggestion will range between "Green Light" and "Red Light," explaining risk in a common man's manner.